The Kite news-reading platform focuses on following others who share interesting content. At the Northside Innovation Conference and Expo, social news-reading app Kite has launched on iOS devices. The app was created to allow users to read and share news and articles from any website, and to follow users for a feed of socially curated content. In Kite, articles are presented socially, rather than by topic, based on the users people follow, with the idea being to follow users who share interesting content (like one follows others on Instagram or Twitter). As a news-finding app, users can browse stories from top featured websites, or use the app as a browser to visit any website. In the browse experience, users can read articles normally, tap on the star button to add the current website to the bookmarked list within the app, or tap to share the article within Kite. When sharing to Kite, users can also share the article out to Facebook, Twitter or LinkedIn, as well as add their own comment. On the Kite feed, each story is presented alongside an image and brief preview of the article. Users can tap to read each article, add items to their reading list for later, share articles to their own Kite feed (so their followers can also browse them), or post likes and comments on individual posts. 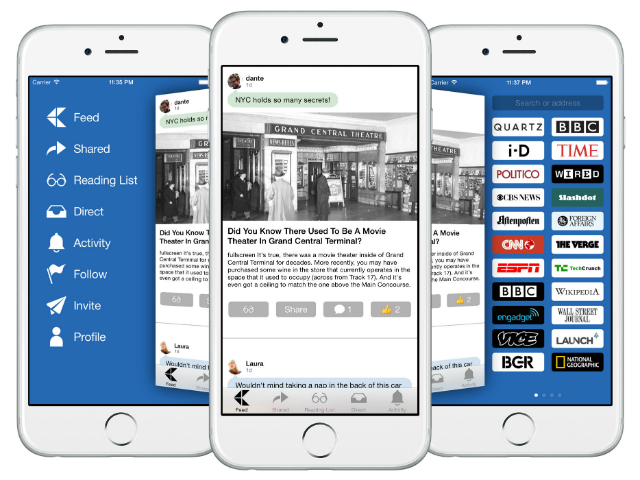 In addition to social sharing, users can send articles directly and privately through the app. I wanted to alleviate the need for people to have individual apps for different content sources, and instead have everything in one place, beautifully integrated, while also making that experience social. Just as Instagram created a new public social graph for photo sharing, Kite introduces a social graph for sharing news and articles. Most importantly, it’s an app for everyone – simply a great app for reading and sharing, to be used throughout the day, every day. We’re honored to launch Kite at Northside, whose track record for cultivating innovation continues to reverberate throughout the creative community. Kite is now available to download for free on the iTunes App Store. Users can enter invite code “Northside” to access the app and create their account.